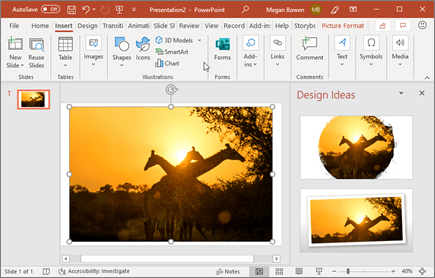 If you're an Office 365 subscriber, PowerPoint Designer lets you create designer slides in two steps: just add an image, and then select a design. Select Insert > Picture, browse for the picture you want, and select Insert. 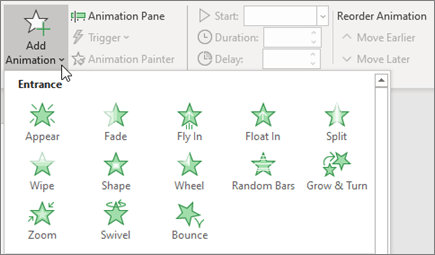 The Design Ideas pane opens, and offers several design options. Select the design option you like. On the Transitions tab, select the effect you want. To undo a transition, select None. Select the text or object you want to animate. On the Animations tab, select Add Animation, and select the animation you want from the drop-down. For Start, select When Clicked, With Previous, or After Previous. You can also select the Duration or Delay. To learn more, see Animate text or objects.